Extra! Extra! 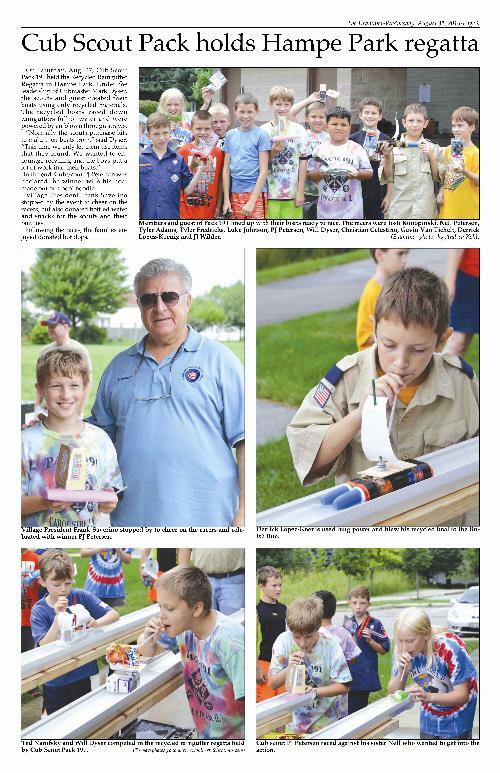 Read all about pack 191 in the news! This year our pack both made and collected holiday cards to send to wounded and sick veterans. We collected 117 cards, both hand made and store bought, each with personalized notes and letters. The cards were sent to Home Front Hugs, Operation Healing Angel, who then sends them to VA Hospitals where they are given to Veterans and the special people that are caring for them. Our pack picnic and Recycling Rain-gutter Regatta was a big success! Special thank you goes out to the Mayor for donating water and cookies as well as stopping by to cheer on the boys as the raced! Also a huge thank you to Flip Flops in Carol Stream for their support and generous donation of all the hotdogs and toppings. 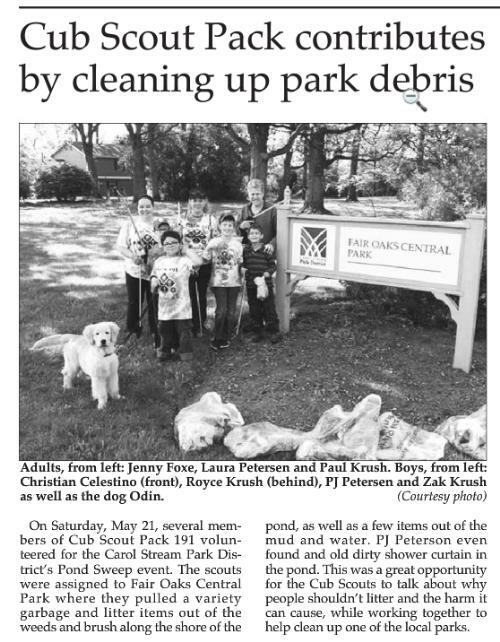 Cub Scouts PJ Petersen, Royce Krush, Zak Krush, and Christian Celestino along with leaders Laura Petersen, Paul Krush, and Jenny Foxe helped clean up a local park. 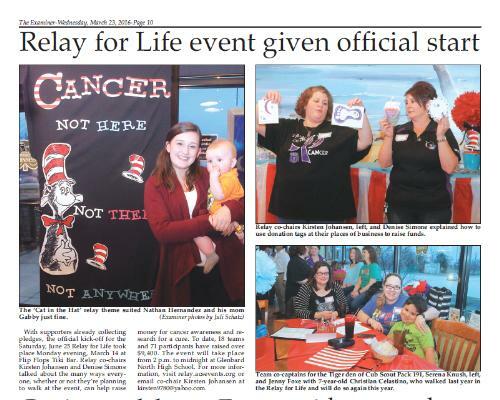 Tiger Scout Christian Celestino along with Team co-captains Serena Krush (Tiger Den Leader) & Jenny Foxe (Assistant Den Leader), attended the Relay For Life Kick off event at Flip Flops in Carol Stream! Pack 191 will participate in this year's Carol Stream Relay for Life event on June 25th.